Peking University HBSC Business School always praises “honor and responsibility”. Students of Peking University HBSC Business School remember the encouragement of Professor Hai Wen “Dream big, Work hard”. On the public welfare career of Donating Money for Education, they shows the meaning of sense of mission and sense of responsibility with action. They deliver the love and make a contribution to education career, show the style and model of the famous school. 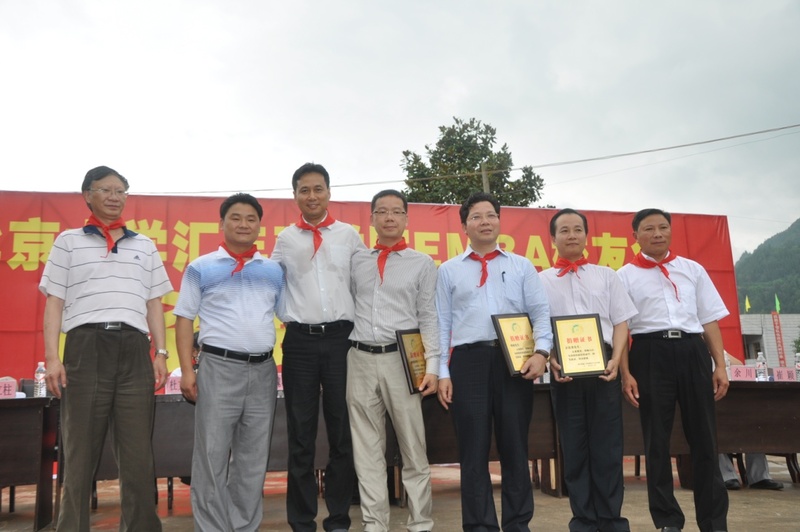 On the afternoon of July 3, it was rainy in Tongjiang County, Bazhong city in Sichuan, an old revolutionary base area. 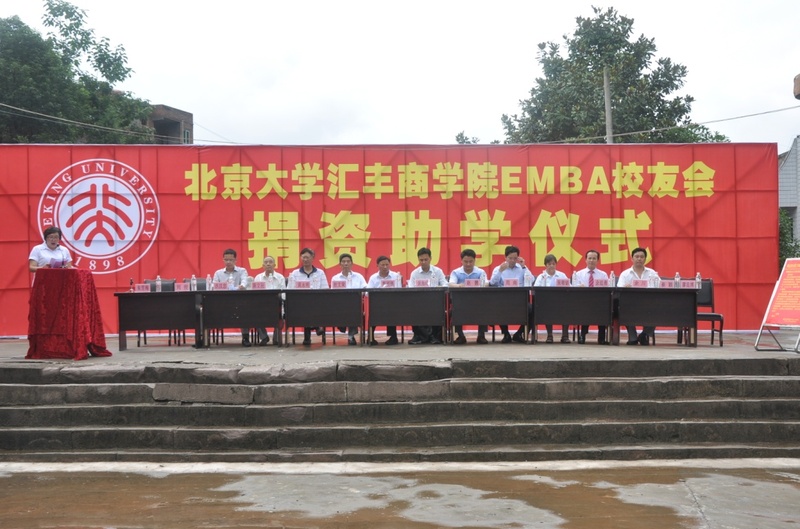 However, this does not affect the enthusiasm of the teachers and students in Sichuan Airlines hope primary school for welcoming their distant guests. Honest and enthusiastic students from Nixi Village primary school gave a warm welcome to Peking University HSBC EMBA Alumni entrepreneurs. Around 3 o'clock in the afternoon, the sky was clear. Led by Professor Huang Haifeng, the assistant Dean of Peking University HSBC Business School, visitors from EMBA Alumni Association entered the campus with the sound of the drums. 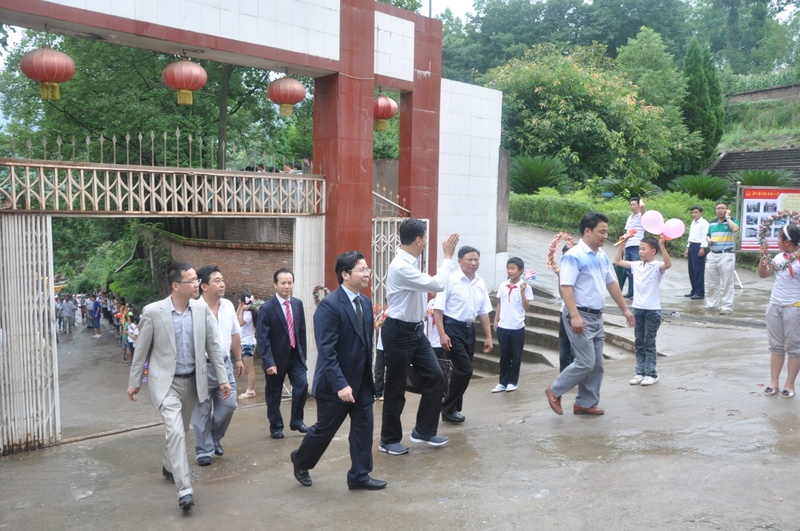 Accompanied by leaders of Nixi Village Central Primary School, Professor Huang, Professor Du Wentang, Professor Zhang Jingming, Professor Chen Lizhu, together with Zhou Nan(vice president), Yu Tingyong, Hong Hanzhong from Peking University HSBC EMBA Alumni Association, learned about the school's educational environment, educational facilities, etc. 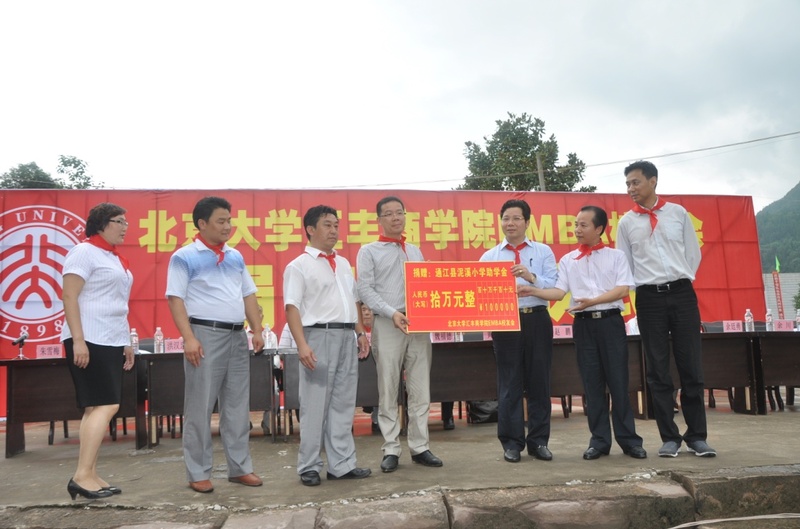 Subsequently, the donation ceremony began. 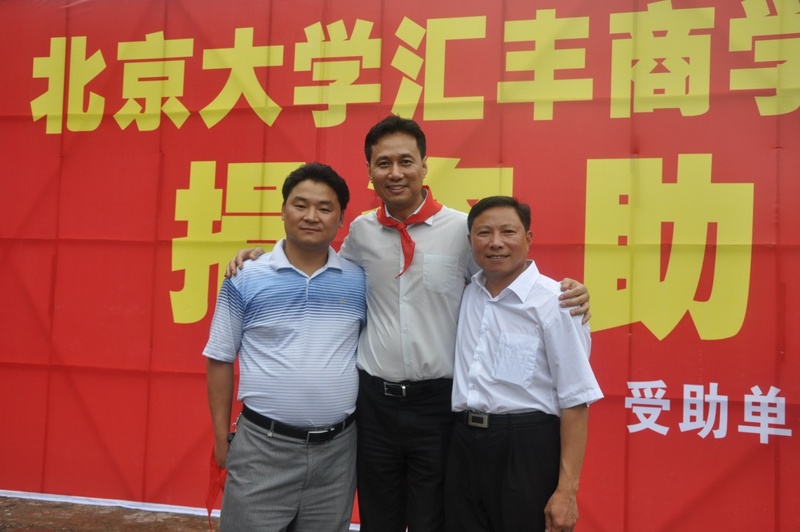 Wei Defu (the vice secretary of Tongjiang County People's Political Consultative Conference), Huang Yongming (the deputy director of TongjiangCounty Education Bureau), Zhaopeng (The secretary of Nixi Village Party committee), Zhu Xuemei(the officer of Nixiang Village), Yu Chuan (principal of Sichuan Airlines Hope Primary School in Nixi Village), and all teachers and students attended the donation ceremony. 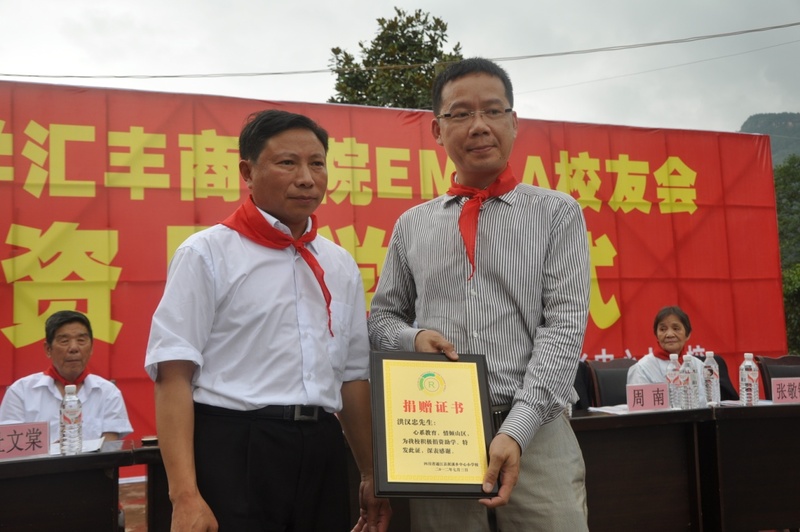 During the donation ceremony, Peking University HSBC Business School EMBA Alumni Association has donated RMB 100 thousand yuan in grants and donated a set of e-learning facilities to the Nixi Village Central Primary School. The entire donation ceremony exuded rich love. 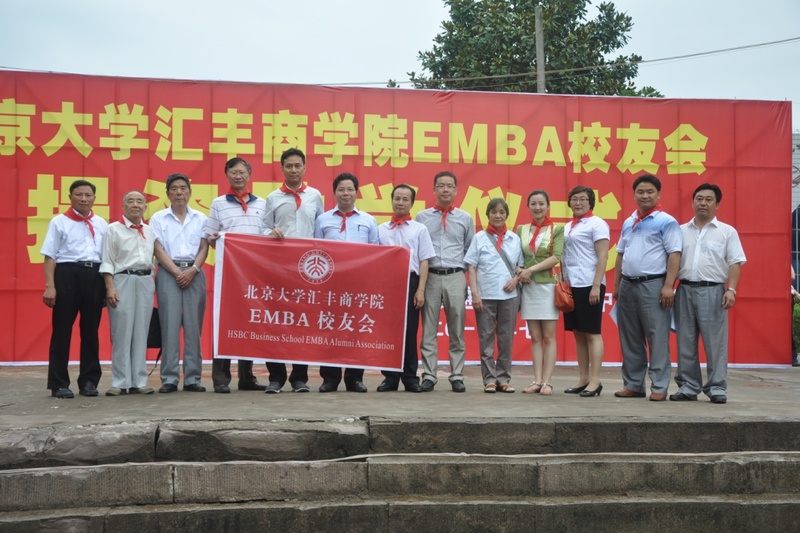 Peking University HSBC Business School EMBA Alumni Association donated RMB 100 thousand yuan. 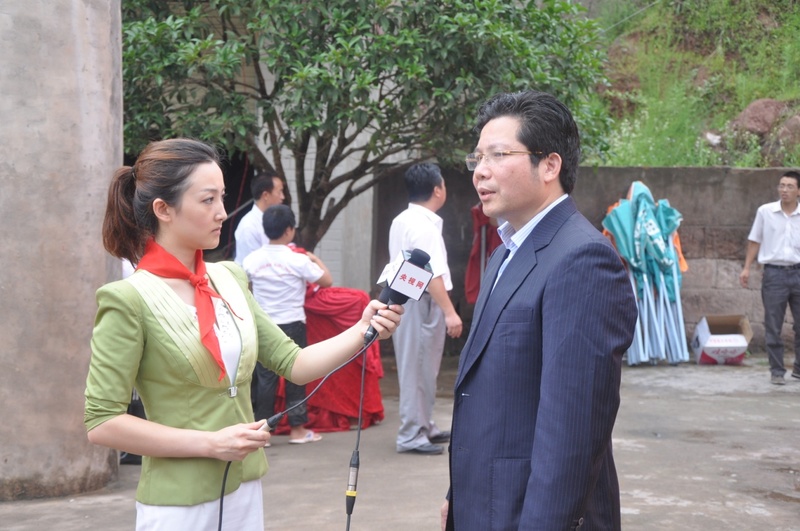 Zhou Nan，vice president of Peking University HSBC School of Business EMBA Alumni Association, gave a speech at the donation ceremony. 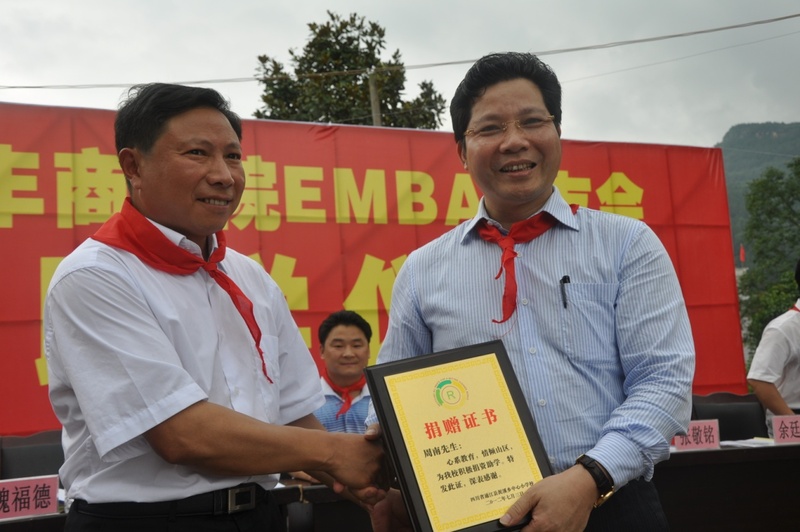 He encouraged the children to stand on solid ground, establish the ideal and learn hard in order to return and develop hometown. 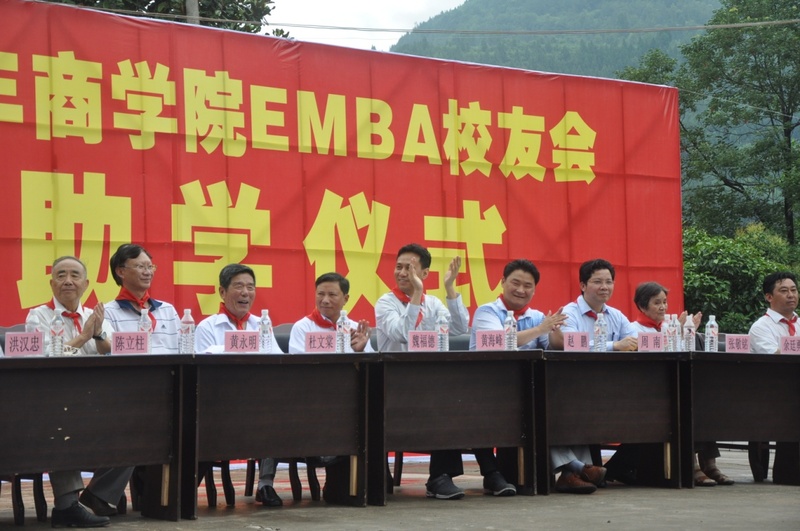 Mr. Yu Tingyong, on behalf of EMBA Alumni Association, sang a song for the teachers and students, which won rounds of applause. 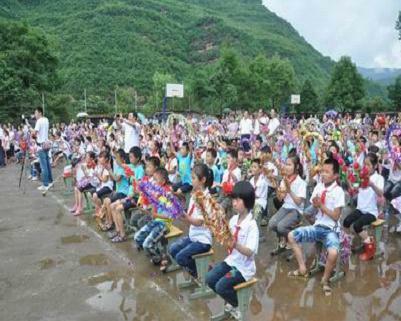 Tongjiang Nixi center primary school is a Lenin primary school which was build by the red army. In 1988, the school moved to new building which was Yang's family ancestral hall. There are only one teaching building. 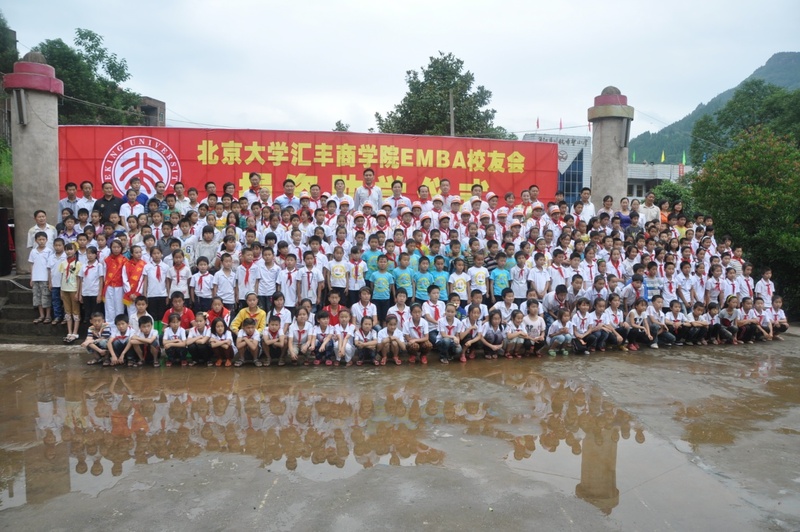 In 1995, the school became attached to Sichuan Airlines. 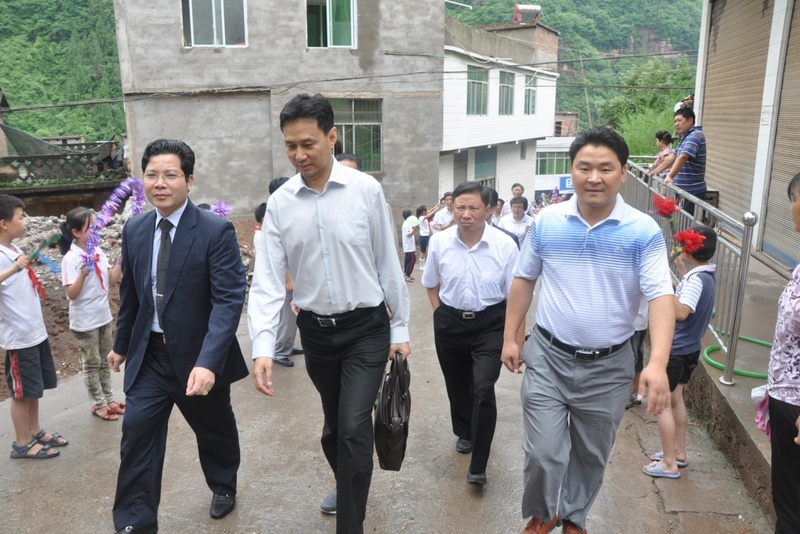 By their financing aid, the school's appearance and teaching facilities improved gradually. The school changed her name as“Tongjiang Sichuan Airlines hope primary school”. She had been rated as ”School spirit demonstration school” ”Tongjiang famous school” , ”First level unit on performance” and ”The best unit of civilization” . As for the children at the school, the love of the community likes spring rain, sunshine which warms the children’s dream, inspired them to pursue their dreams and keep on climbing on their study road. 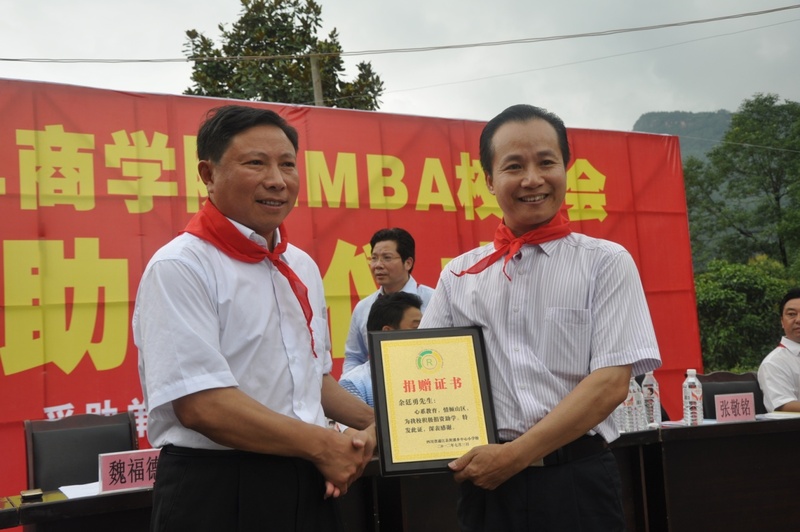 Tongjiang CPPC vice secretary Wei Fude (right) issue the certificate to Peking University HBSC Business School EMBA alumni association vice president Mr.Zhou Nan. 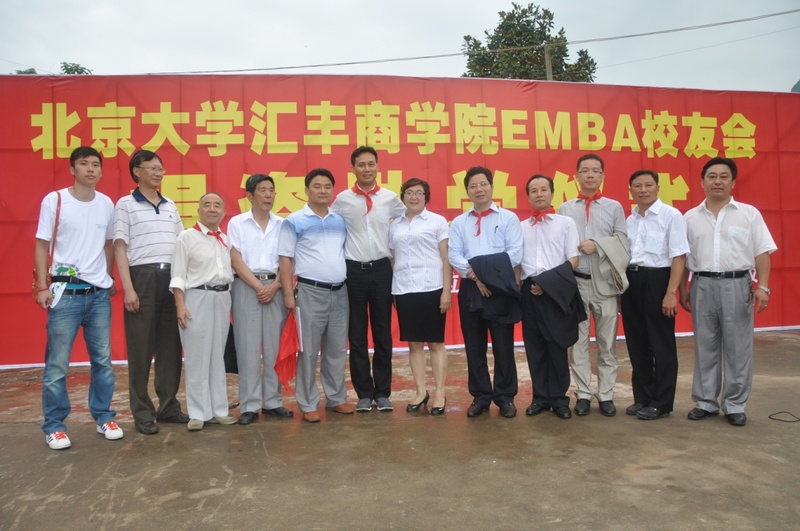 Peking University HBSC Business School EMBA alumni association representative took photos with Tongjiang party and government officials and school leaders.